Light felted sweatshirt with Gucci cities on front. 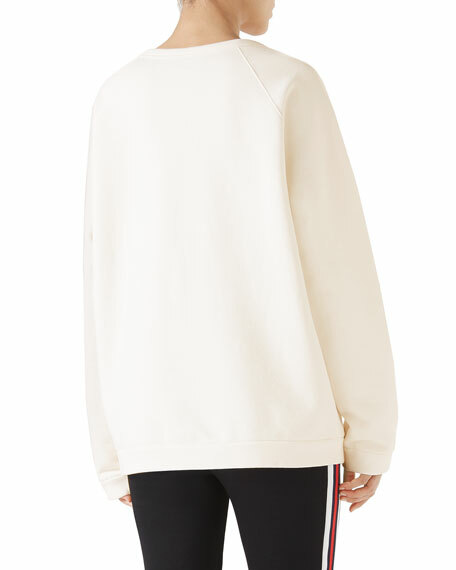 Gucci sweatshirt in striped cotton jersey. "Gucci pour la Côte d'Azur" patch on the front. Crew neckline. Long sleeves. Button detail on the shoulders. Cotton. Made in Italy. Black technical jersey with stripes down the sleeves. Crystal embroidery frames stripes. Front zip closure; O-ring pull. Long sleeves. Oversized fit. Polyester/cotton. Made in Italy. 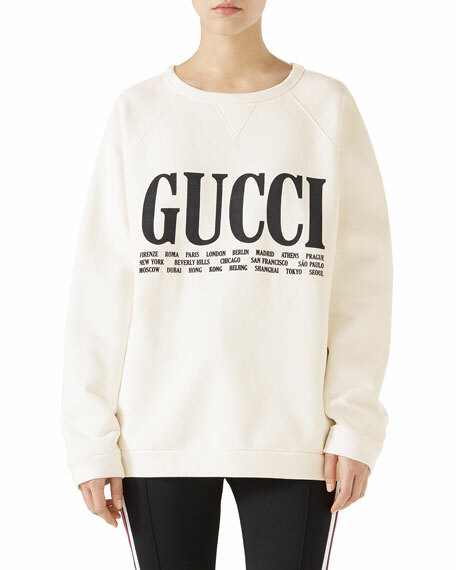 Gucci felted cotton jersey sweatshirt with Gucci Interlocking G buckle print, inspired by the men's and women's ready-to-wear collection. Crystal detail throughout front. Banded collar, cuffs, and hem. Crew neckline. Long, raglan sleeves. Cotton. Made in Italy. Heavy felt cotton sweatshirt with Orso & Bosco dog-print. Reads: Maison De L'Amour at front. Crystal-beaded "Guccy" at back. Crew neckline. Long sleeves. Oversized fit. Pullover style. Made in Italy.